LV's View: 2002 status - - Listed as first team quarterback following spring practice . . . completed 18-21 passes for 337 yards and four touchdowns in spring game, leading Black Shirts to a 38-3 win . . . 2001 - - saw action in 10 games . . . season totals include 41-68 for 582 yards and four TDs, with two interceptions . . . also rushed 41 times for 151 yards and two scores . . . led Iowa scoring drives on 17 of 37 possessions that he began . . . completed 3-4 passes vs. Kent State for 71 yards, including a 38-yard completion on first pass of his career . . . also had one rush for seven yards . . . completed 8-15 passes vs. Miami for 65 yards . . . rushed nine times for 24 yards and scored first career touchdown on a five-yard run . . . 14 yards on three rushing attempts at Purdue, where he completed 1-2 passes for seven yards . . . completed 5-8 passes vs. Michigan for 66 yards and one score and rushed three times for 19 yards . . . completed 11-23 passes for 162 yards and two TDs at Wisconsin, while rushing 10 times for 42 yards . . . completed 7-9 passes for 145 yards and one score vs. Northwestern while rushing for 25 yards on four carries . . . rushed six times for 36 yards vs. Minnesota and completed all three pass attempts for 47 yards . . . completed 2-3 attempts at Iowa State for 14 yards . . . saw limited action on Alamo Bowl win over Texas Tech. Junior College - - Originally enrolled at Central Florida, but transferred to Hinds Junior College following redshirt freshman year . . . played receiver as a junior college freshman . . . quarterbacked the team to an 11-1 record as a sophomore . . . Hinds was ranked as high as fourth nationally . . . Hinds won the state junior college title last year as he threw for over 2,000 yards and rushed for over 500 yards while scoring 13 times on the ground . . . He passed for 16 touchdowns last year . . . junior college coach was Gene Murphy. For his part, Banks is a first year starter who has propelled an unheralded Iowa squad to a remarkable 11-1 record and a probable BCS invite. Along the way, Banks has completed 60% of his pass attempts for over 2,300 yards; more impressively, he has thrown for 25 TDs against just 4 interceptions. To boot, the athletic Banks has rushed for almost 400 more yards, although he is more scrambler than pure runner. Whether that translates into a high draft selection is another matter, however, for Banks. Like the 'other' in-state QB, Seneca Wallace of Iowa State, scouts love Banks athleticism and ability to make game-turning plays. Banks also has a strong enough arm and very quick release; he's also very mobile and throws well on the run, especially in the 12-15 yard range, although he needs work on his medium accuracy as well as throwing deep. The big question for Banks, though, is the lack of prototype size. At a very generous 6-1 and maybe190 pounds, Banks is bigger than ISU's Wallace, but is still a long way from the 6-4, 225 pound stud that NFL teams prefer in their potential elite QBs. Right now, there is a pretty good debate raging in the scouting community whether Banks is going to end up as a bigger version of Tampa Bay's Shaun King or a smaller version of the Falcons' electric Michael Vick. Either way, though, Banks ultimately could end up being another worthwhile gamble for a team looking for a mobile young developmental type QB in the mid- to late round areas of this coming April's draft. Strengths: Mobile QB, Can make throws on Run, Good Leader and Good Athlete. Weaknesses: Small for a QB,Fumbling Problems, Holding the ball too long, Interceptions, and Tipped passes. LV's View: Earned two national player of the week awards (USA Today and CollegeSportsNews.com) after engineering a 35-26 win at Pittsburgh, Sept. 8, 2001...Completed 37 of 65 passes in that game for 343 yards and four touchdowns...Had just one interception and no sacks among 65 pass attempts...Extended string of sackless pass attempts to 119 before a late sack at Memphis, Sept. 22...An outstanding all-purpose quarterback, he has essentially become the author of the USF offensive record book...The program's all-time leader in total offense (7,451 yards), pass yards (6,518), pass completions (565) and pass attempts (1,014)...A precision passer, he has completed 55.7 percent of his career attempts, while throwing just 25 interceptions in 33 games, including just four among 296 pass attempts in 2000. Strengths: Prototypcial Size, Extremely Strong arm, and Ability to throw downfield. LV's View: Henry Burris is currently the third quarterback on the Chicago Bears depth chart. He should be considered a developmental type QB. He got the opportunity to play in 2002, because Chris Chandler and Jim Miller were hurt. In his one start Burris was not effective and was pulled. Burris is an intriguing, young quarterback prospect who came to the NFL following four seasons in the Canadian Football League. Enjoyed a record-setting collegiate career at Temple, he then spent three years as a backup with the CFL's Calgary Stampeders (1997-99), languishing his first two seasons behind starter Jeff Garcia, now a Pro Bowl quarterback for the San Francisco 49ers. Moved to the Saskatchewan Roughriders as a free agent in 2000 for the opportunity to be a starter. Took full advantage of that chance, throwing for 30 touchdowns and over 4,600 yards in his one season with Saskatchewan. Completed 349 of 647 passes (53.9%) for 5,259 yards and 34 touchdowns with 30 interceptions, a 79.1 rating, over his four seasons in the Canadian Football League. Was a member of Calgary's 1998 Grey Cup championship team. Burris will have a difficult time convincing NFL Personnel that he is not just a CFL QB. Burris in my opinion would benefit from sometime in NFL Europe. He has the skills to be successful, but he is still learning the NFL game. Strengths: Mobile, Strong arm, and Spent time in West Coast Offenses. Weaknesses: NFL Inexperience, Height, and Turnovers. LV's View: Printers has passed for 4,621 yards and 37 touchdowns while going 22-9 as a three-year starter at TCU. But instability in TCU's coaching ranks along with a change in offensive philosophy led to his desire to transfer and search elsewhere for happiness. Based on early indications, Printers has found it - along with a quarterback-friendly offense - at FAMU. m in 2001. Printers left TCU ranked third in school history in career passing yards (4,621) and touchdown passes (37), and fourth in completions (324). In his final game at TCU, he threw four interceptions in a 29-8 loss to Texas A&M in the galleryfurniture.com Bowl. 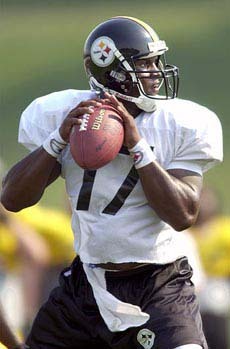 LV's View: Currently Tee Martin is on the Philadelphia Eagles roster as the 4th String QB on the practice squad. 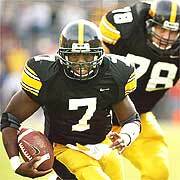 Martin was on the street for most of the 2002 season after being cut in training camp by the Pittsburgh Steelers. The Eagles signed Martin after Donovan McNabb and Koy Detmer were injured. Martin spent the summer of 2002 in NFL Europe with the Rhein Fire and led them to the championship game. When Martin returned he was behind on the Steelers depth chart to Tommy Maddox, Kordell Stewart, and Charlie Batch so he was released. Martin was a very successful college QB at Tennessee and led his team to a national championship and a perfect record as a junior in 1998. During his magical season, Martin replaced legend Peyton Manning and established school marks for efficiency and interception lows. Martin didn�t have the senior season expected and slipped to the 5th round of the 2000 NFL Draft, being selected by the Pittsburgh Steelers. The Steelers wanted Martin to be the heir apparent to Kordell Stewart, but he always was stuck in the 3rd QB position. Martin is an intriguing prospect, because he performed well in college, NFL Europe, and pre-season games. I believe he needs an opportunity to learn and compete legitimately for a starting job or lead backup position. Once Tee Martin is given the opportunity , we will be able to see if he can be the same QB as in his magical 1998 college season. Strengths: Good Size, Strong arm, and Efficient Passer. Weaknesses:Holds the ball too long, Not Very Mobile, and Untimely Turnovers. LV's View: Spergon Wynne came to the NFL relatively unknown in the 2000 NFL Draft. He was selected by the Browns in the seventh round (183rd overall) of the 2000 NFL Draft. The Browns former Head Coach drafted Wynne to be the backup to Tim Couch. Wynne however did not perform well when Couch was injured and was traded to the Minnesota Vikings from Cleveland for a future draft choice on September 2, 2001. With the Vikings Wynne has seen spot duty, but has not gotten to take any significant snaps, playing behind Daunte Culpepper. 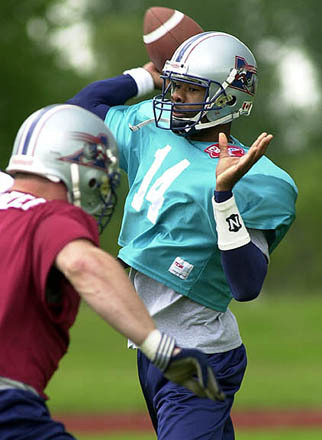 Wynne spent the summer of 2001 in NFL Europe with the Amsterdam Admirals. In 2001 NFL Season, Wynne played in three games and started two on the season. 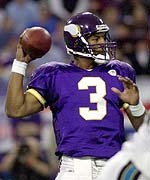 He set team records in attempts (39) and completions (24) by a Vikings' quarterback playing in his first game vs. Jacksonville (12/23), filling in for an injured Todd Bouman on the second drive of the game. Wynne started his first game at Green Bay (12/30) and went 11-30 for 114 yards, including a 47-yard touchdown pass to tight end Byron Chamberlain. The pass to Chamberlain was the first touchdown pass of his career. Wynne also started at Baltimore (1/7/02) in the season finale and completed 13-29 passes for 86 yards. Dressed but inactive as the third quarterback for the first 12 games of the season. 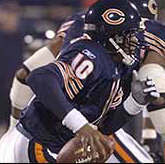 In 2000, Wynne appeared in seven games during his rookie season, including one start, and completed 22 of 54 passes for 167 yards with one interception. Recorded career-highs vs. Cincinnati (10/29) with seven completions, 82 yards passing, and a long pass of 32 yards to Kevin Johnson. Made his NFL debut at Oakland (9/24) late in the fourth quarter and completed two of five passes for 15 yards. Wynne�s College Highlights Include: Despite playing only two seasons at Southwest Texas State, ranks sixth on the school's career-record list with 3,497 yards passing. All-Southland Football League second-team choice in 1999. Completed 161 of 323 passes for 1,646 yards and 14 touchdowns in '99. In 1998, started every game and completed 173 of 284 passes for 1,851 yards and 10 touchdowns. Wynne attended the University of Minnesota from 1995-97 and lettered once. I believe Wynne is in a good position to be a career backup in the NFL. He currently is behind Culpepper and Bouman. I don�t believe that he has the tools to replace either of them. He does however have the size and knowledge of Pro Style offenses that coaches like. If I were Wynne, I would ask for a legitimate chance at number two for the Vikings. Time will only tell where Wynne lands, but he will have to compete every year to stay in the NFL. He already has spent time in NFL Europe, so the next step is another league or team, if he is looking for a starting opportunity. Strengths: Prototypical Size, Strong arm, and Ability to throw downfield. Weaknesses:Holding the ball too long, Interceptions, and Lack of NFL Experience. LV's View: Currently Joe Hamilton is listed as the 4th QB on the Tampa Bay Buccaneers roster. Hamilton is spending the 2002 season on the Injured Reserve list after tearing his ACL (Knee), while playing for the Frankfurt Galaxy in NFL Europe in the summer of 2002. At the time of his injury the Galaxy were in first place for the league and Hamilton was one of the highest rated passers. Hamilton came to the Buccaneers as an undrafted F\A out of Georgia Tech in 2000. 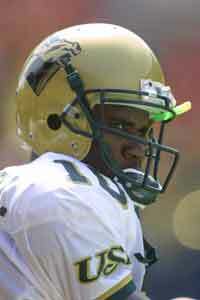 Hamilton was a starter at Georgia Tech since his freshman year and left the school as one of the most decorated QB in school history. Hamilton was thought to be too small for the NFL and did not receive much interest going into the draft. He however viewed himself like Doug Flutie and didn�t care about his height as long as he received an opportunity. The CFL wanted Hamilton as a starter, but he wanted to learn the QB position in the NFL. With Tony Dungy leaving in 2002 for the Indianapolis Colts, new coach John Gruden was intrigued by Hamilton and wanted to give him a legitimate opportunity at earning the backup position behind Brad Johnson. The Bucs sent Hamilton to Europe to learn and finally get the chance to play. Hamilton was always stuck behind Brad Johnson, Rob Johnson, and Shaun King. He finally was able to shine in NFL Europe, but he got hurt midway through the season. I am not sure how tearing his ACL will effect his career, but I believe Hamilton will get a chance. The Buccaneers contracts with Shaun King and Rob Johnson expire at the end of the 2002-2003 season, so there will be an opening for a backup. Hamilton is very gritty and talented, but his lack of height will always be a question to NFL Personnel evaluators. The Black Quarterback Website has been accessed times. Copyright (c) 2002 by Vance Information Services Team (VIST).